We are a "curb to curb" coordinated and accessible transit service available to all residents of York County for non-emergency purposes. "Curb to curb" means that we'll pick you up and deliver you to the curb of your choice. Door-to-door assistance is available upon request for individuals with a disability. Due to the high demand of this service, we take ride reservations on a "first-call, first-serve" basis. Call our dispatch office to secure your requested time and location. Same day service is provided on a space available basis. We honor first-call, first-served because the schedules fill very rapidly. You may leave request on our voice mail system. Requests will be acted upon when office reopens. except on State of Nebraska holidays. 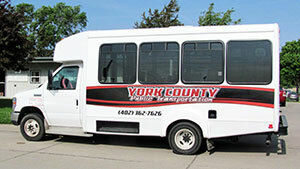 In City Limits: Transportation service in and around the city of York available Monday through Friday from 8:00 a.m. to 4:30 p.m. Limited services are available on Saturdays and many holidays, but require one working days' notice. No service is available on Thanksgiving Day, Christmas Day and New Year's Day. In County (Out of City limits): Service to and from rural areas of York County to the city of York or to other rural areas within York County available Monday through Friday from 8:00 a.m. to 4:30 p.m., with one working days' notice. Out of County: Service to Lincoln or Grand Island are provided on Thursdays and require one working days' notice. Please contact our office for current schedule. ​Rides may be cancelled when unsafe driving conditions are present. Service cancellations will be announced via 1370 radio. Be Prepared: Due to numerous variables that each driver must endure throughout his or her day (traffic, weather, schedules, etc.) please be available for your ride 15 minutes before your scheduled pickup time, and be prepared to wait up to 15 minutes after your scheduled pickup time for your ride. Be Responsible: "No show" or Late Cancel" policy: Any passenger who does not cancel their scheduled ride within one hour of pick-up time is considered a "No show." Repeated "No Shows" by any passenger may result in a suspension in service privileges for up to two (2) weeks. York County Aging Services Program Manager shall determine all suspensions. Drive-thru stops are considered a boarding and will require an additional punch. To apply for reduced rate, complete our Fee Determination Form and submit to the York County Public Transportation Office. Drivers may leave their vehicle to provide minimal assistance in boarding and/or disembarking; however, drivers are restricted from picking up any item weighing 25 lbs. or more. Unless a rider has a documented disability, the driver can remove groceries and/or other items from the bus to the curb only. Drivers are prohibited from carrying items of any kind further than the front door of residence. Any passenger that may require additional assistance is asked to bring their own aide (no fare is required for aides). Please do not exceed four bags of groceries when boarding our buses. Passengers are asked to NOT leave any items or packages on the bus while they do additional shopping or make additional stops. Drivers are authorized to use their discretion and may refuse any and all stops that they feel may be UNSAFE and/or inaccessible to the driver, the rider and/or the vehicle. To wear seatbelts unless a "Certificate of Exemption" is presented to the driver. To stay seated at all times until the bus comes to a complete stop and the passenger doors are open. To prompt and courteous service. To be given the same service as any other passenger. To a safe and comfortable ride. To a fair hearing of any grievance. To request this information in an accessible format. Engaging in prohibited or illegal actions. Carrying hazardous objects or weapons. Transporting flammable, caustic, or poisonous materials. Playing stereos without the use of headphones. All stops (including drive thru stops) must be pre-scheduled through the dispatcher. You are welcome to schedule your return trip with a specific time, or you may utilize our "will-call" option. Will-call is handy for appointments with unspecified completion times.